Soups are inherently comforting dishes. Load them up with vegetables and you have a filling and fulfilling meal in a bowl. I had an unused packet of Fava beans lying around at home and decided to use it in a soup. I had planned a photography birthday party and wanted to serve this soup as a starter. Thus the idea of using corn cobs came into play as they reminded me of the big lenses used in DSLRs. As the soup is dairy and fat-free, the flavours of the vegetables and beans really shine. Do try it as it is oil-free, wholesome and healthy. Combine potatoes, carrot, cut corn, half the fava beans, half the green peas and vegetable stock in a pressure cooker. Bring it to high pressure and cook for 15 mins on low flame. If you are not using the pressure cooker method, you can also boil these contents in the vegetable stock on a stove top but it will take much more time for the vegetables to lose their rawness. Transfer the liquid from the cooker to a pot and place it on the stove top. Bring the soup to a simmer. Using a masher, mash the vegetables such that the soup thickens. Ensure that you only partially mash the vegetables so that large pieces remain. Add remaining green peas and fava beans and let it cook through for another 7 mins on low flame. Add salt at this stage and finally sprinkle the ground pepper. Switch off the flame. 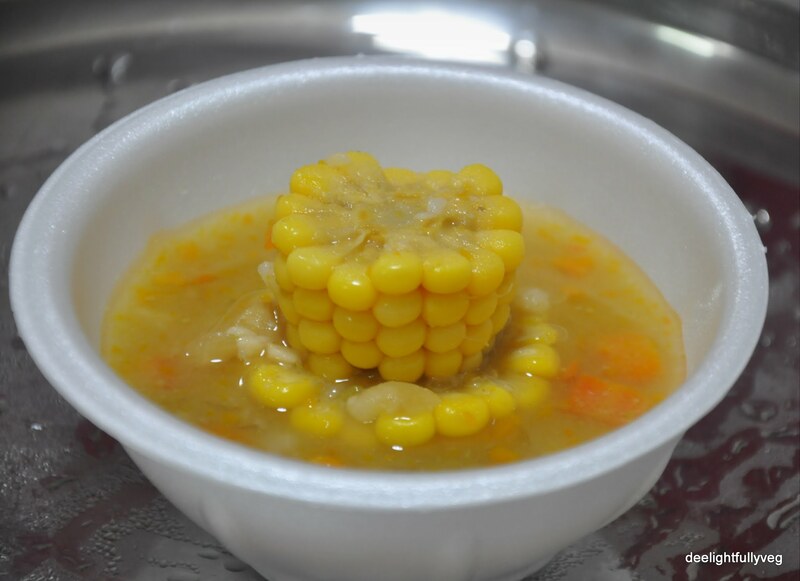 Place one piece of the corn cob in every bowl in the center, ladle in the soup and garnish with coriander on the sides before serving. This will be one delicious bowl of soup that you will enjoy! If you are using the “whistle” method for pressure cooking, let it sound 3 whistles. Do not mash the vegetables evenly. There should be pieces of different sizes to give texture to the soup. 2 cups black beans, soaked overnight. Else use canned ones. Rinse the quinoa at least 3 times in tap water. Drain the water. Cook the rinsed quinoa in the vegetable broth on low flame. Add some salt. It will take around 15 mins for the quinoa to absorb all the broth. Once the liquid is absorbed (around 15 minutes), turn off the flame. 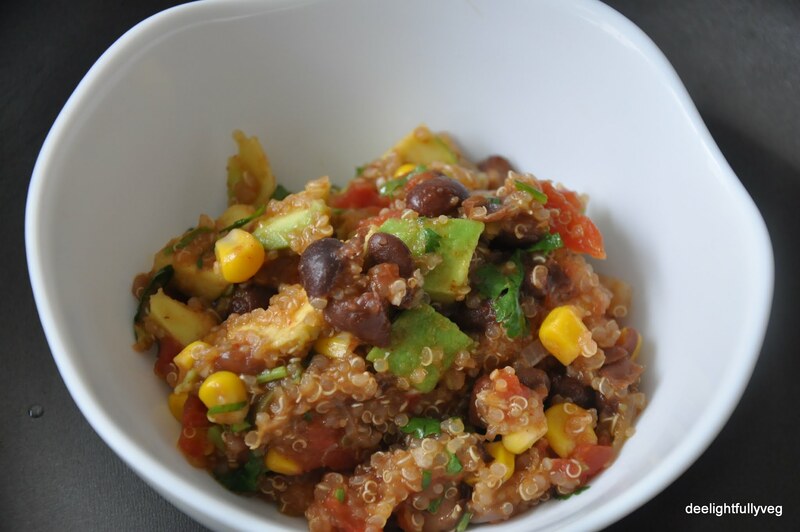 Leave the quinoa covered for 15 minutes. Then fluff it gently with a fork. In a pot, saute the onion and red bell pepper in olive oil till they turn slightly brown. Add salt, pepper and cumin powder to the veggies when they are cooking on the flame. Then add the garlic and saute for a minute. Add frozen corn and black beans. Lower the flame and continue cooking till they are nicely done. Turn off the flame. Now add the fluffed quinoa to the pot and mix it gently with the veggies. At the end, garnish the one-pot filling with avocado and coriander and mix well. Squeeze a bit of lemon on top. 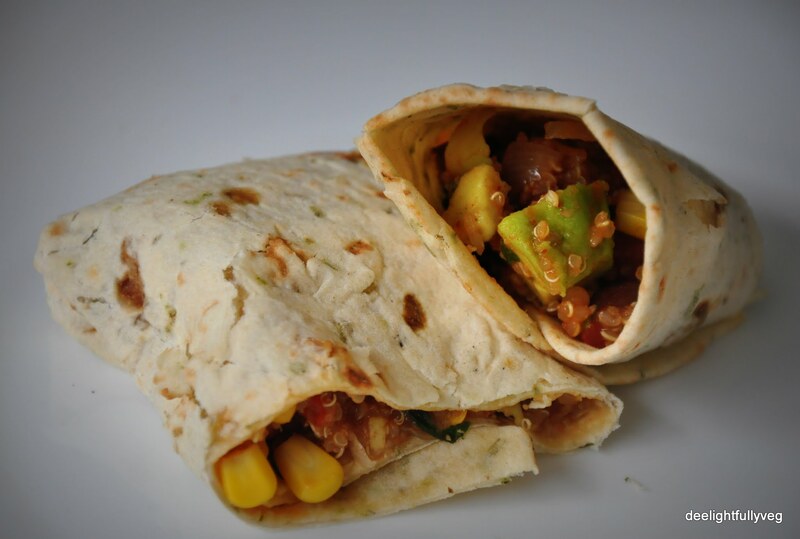 Fill this into a wrap and take a bite and you will love the flavours! If using canned beans, add them in after the corn has some time to cook. You can also cook the soaked beans separately (on the gas or the pressure cooker). Do not mash the avocado into the filling. Be gentle.